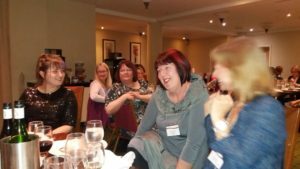 It seemed appropriate to use an item of food in my title as there was an abundance of the stuff at the 2017 conference of the Society for Editors and Proofreaders – a veritable cornucopia at every breakfast, lunch and dinner, topped up with a constant supply of tea, coffee and biscuits. Given the intellectual intensity involved, it provided much-needed fuel! I set off on my thankfully straightforward journey late on Saturday morning, and got in touch with two fellow editors, Andrea and Lorraine, who I’d made contact with via the SfEP forum about sharing a taxi from St Neots station. As the heavens opened just as our train from London pulled in, we were relieved to see that the taxi firm had a cabin for us to shelter in – complete with tabby cat. 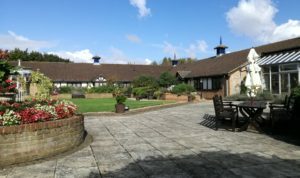 After a short drive we arrived at the tranquil countryside setting of Wyboston Lakes, checked in quickly and easily, and had a cup of tea whilst waiting for our rooms to be ready. I’m not an early riser, but the combination of travel alarm clock and the centre’s wake-up call service managed to get me out of my (extremely comfortable) bed by 7.30am on Sunday. After a great shower and a hearty breakfast, off I went to my first session, on Word styles. A delicious lunch and then it was a discussion on managing client relationships, followed by a presentation by getting the most out of your directory listing by the ever-helpful Nick Jones. Unfortunately, the day proved so tiring that I didn’t have the energy to attend the social media get-together and say hello to my fellow Tweeters, but after another cheeky nap I was refreshed and ready for the gala dinner. 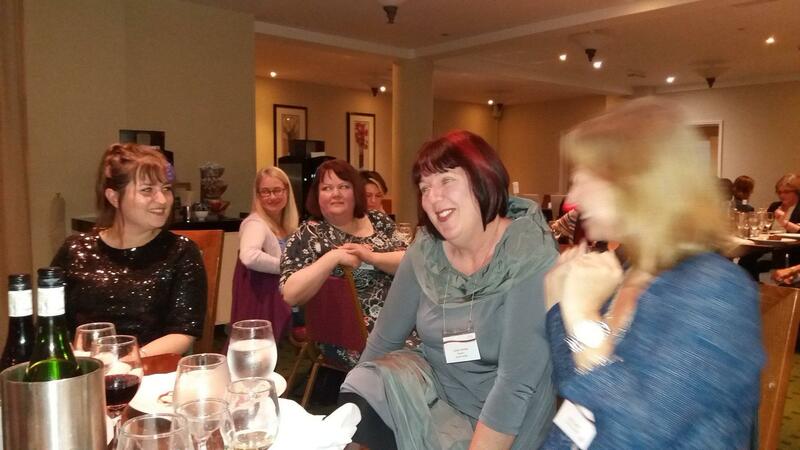 Even Kate’s tale of an appendectomy in a Chinese hospital with no general anaesthetic didn’t put me off another tasty meal; however, I’m not sure Table 17’s members should be allowed to edit poetry (link only for SfEP members)! Monday was another full-on day, starting with a session on rates led by Katherine, Erin and Janet. This was probably one of the two sessions I personally found most valuable. Because I went freelance and joined the SfEP having already worked as an editor for more than 20 years, I didn’t start off with ultra-low rates. But, neither were they anywhere near high, and I’ve since suffered from a bit of ‘paralysis’ when it comes to increasing them. This presentation inspired me to raise my rates for existing clients from January and to review the rates I present to new clients. After a useful hour discussing when, what and how to query, on Monday afternoon I then went to Tracey and Jackie’s session on guerrilla marketing. This was the other session that was most useful – and motivating – for me, as marketing myself is something I still struggle with. Despite this being the final one of the conference, I would have been happy if it had been at least half an hour longer, and went away with lots of good ideas about attracting the clients I want to work with. Proceedings were wrapped up with a very enjoyable closing speech from Mark Forsyth, from whom I learned the lovely word hendiadys. Then another easily arranged taxi share back to St Neots station – this time in sunshine – to catch a nice quiet train back to Kings Cross, where we all went our separate ways. 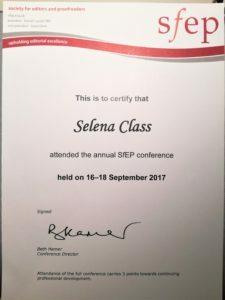 In summary, I’d recommend attending the annual SfEP conference for any member who hasn’t tried it. 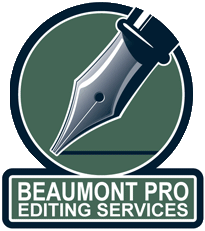 Everyone was so welcoming, friendly and non-judgemental, and it was great just to be able to talk about both editing and freelancing issues with other people in similar situations to your own. Through casual conversations over meals or during tea breaks I’ve been prompted to try utilising macros, and possibly PerfectIt, got tips and leads, and also an opportunity to say hello to one existing and one potential new client. 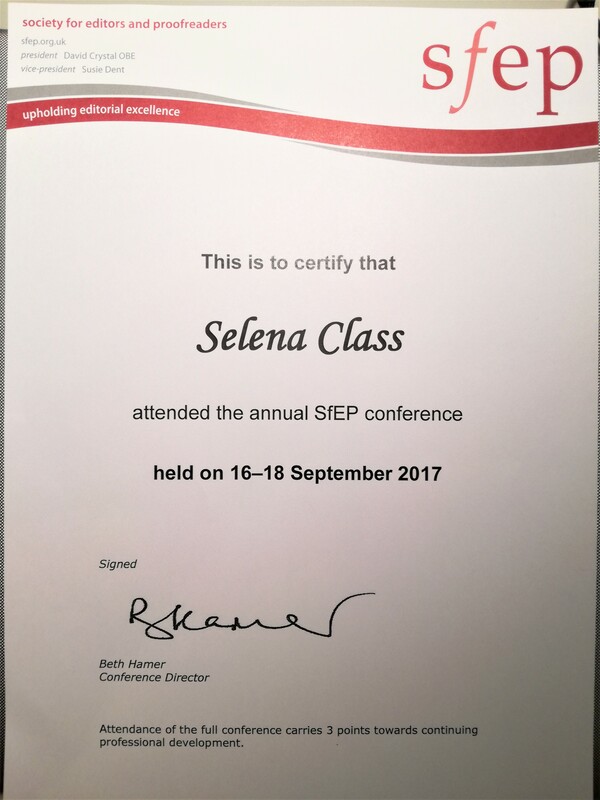 I’ve neglected my professional development to some extent since becoming self-employed, except for bits and pieces picked up on various jobs, so the conference gave me a big boost and provided lots of inspiration for how to sustain and grow my business. I will be certainly be back. Note to self: don’t pack snacks. Great to meet you, Selena! It was very inspiring, wasn’t it.